Forget about hand sanitizer. Unless you're old, the CDC's top ten list of how people check out of this world shows that human behavior, not disease is what will most likely kill you. Someday the personal mystery of how each one of us will meet our maker will be answered, but if you have a scientific mind, the likely exit you will use can be gleaned from data. Recent CDC statistics present the mathematical probabilities of how the grim reaper will find us, calculated by analyzing statistics on deaths in the United States in the year 2014 (Table 1 below). What the data show may surprise you. Outside the extremes, the first year of life and the most aged, death is less about biology and more about living. The leading causes of death for children in the first year of life are birth defects, followed by complications of birth. But if the genetic dice roll of human development does not turn up snake eyes, the number one cause of death for people in the United States after one year of age until they reach 44 years of age, is accidents. Oops! "I've fallen and I can't get up!" isn't about old folks--it's about nearly everyone else. For people over retirement age (65 years), death by unintentional injury drops to 7th place. Maybe the accident-prone just weed themselves out of the picture long before they reach the golden years. Quite disturbing, but perhaps explaining the popularity of so many TV dramas that involve lethal weapons, homicide is a leading cause of death from early childhood throughout the prime of life. Homicide ranks as the third to 5th most common cause of death for all age brackets between 1 and 44. (See the red squares in table 1.) Guys being guys are victims of homicide at 3 times the rate of women (See table 2). The peak period of homicide for males is between the ages of 25-29, but the rates are high for males at all ages compared with females. The murderous villain is not usually the homicidal bogeyman of horror flicks. For both males and females, homicide is twice as likely to be something we engage in among friends and acquaintances as opposed to involving strangers (Table 3). When the victim is a spouse or intimate partner, females are killed at 3.3 times the rate of males. 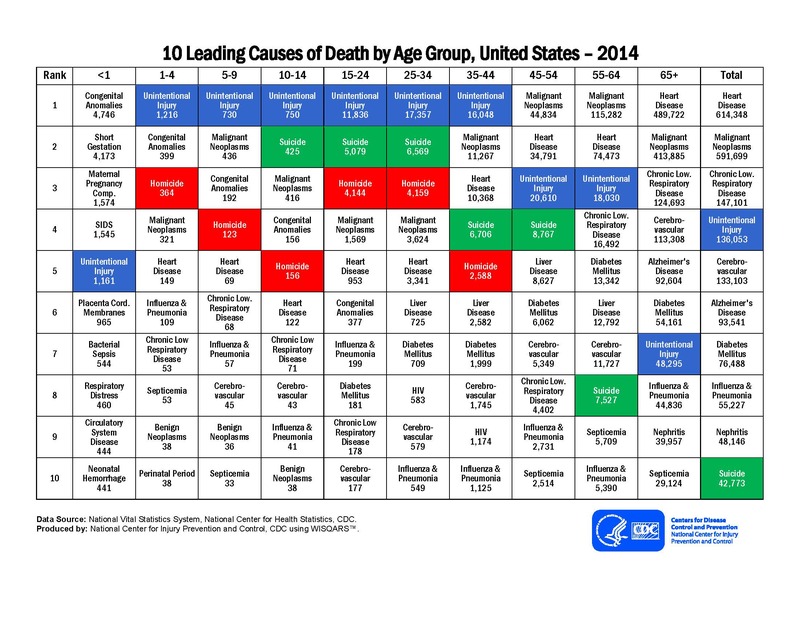 Beating out homicide on the CDC top ten death list is death by suicide (Green squares Table 1). Suicide is second only to death by unintended injury as the most frequent way we die between the ages of 10 and 34. Suicide drops to 4th place in the top ten causes of death for ages 35-54, which is still alarmingly high. The rate of suicide is 4 times higher for men than for women. After the age of 54 the trend is even stronger. Old men past the age of 85 commit suicide at a rate of 45.4/100,000 deaths compared to 3.41 for women --13.3 times higher than ladies. Violent death by accident and violence directed at others or against oneself in suicide are how life is most likely to end, until in old age when disease eventually overtakes the aging body and it succumbs. Despite the terror of Ebola, Zika, and the devastation of mankind in the middle ages by plague, between the ages of 15-34, infectious disease is not the issue, by and large. Death by human behavior -- accidents, suicide and homicide -- are the top three causes of death during these "best years of life." As difficult as it is to understand and control the invisible killers, microbes and cells gone rogue that cause disease, when it comes to reducing death over much of our life, understanding and controlling deadly human behavior is even more difficult. The numbers in the CDC table add up to one conclusion: in addition to the importance of understanding the biological basis of disease, there is a much greater unmet need for basic research to understanding the biological underpinnings of the human brain that guides behavior. Table 1. The top ten most frequent ways Americans die by age group.